Show people you know what style is when you wear fancy shirt and tie sets by Prime Time. 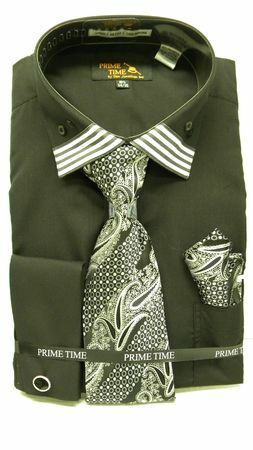 These black fashion dress shirts come with the matching tie set to make a serious style statement without overdoing it. Once you start wearing dress shirt and tie sets, it might be hard to wear any other dress shirt because they take the guess work out of the situation. Made of cotton/poly blend fabric.